Bali Traditional Tour They perform Legong dance. 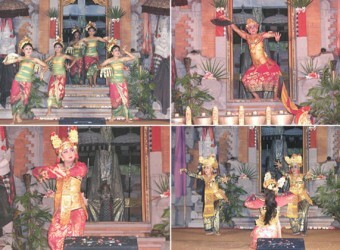 Legong dance is from of Balinese dance. It is a refined dance form characterized by intricate finger movement. Complicated foot work and expressive gestures and facial expressions. Legong dancers are always girls who have not yet reached puberty. They begin rigorous training at about the age of five. I Could Watch Traditional Dance at a Time! Balenganjur procession, Pendet dance, Baris dance, Legong danc, catur angurit music, Kebyar Terompong dance, Barong and Rangda dance was worth seeing enough.And I think Pendet dance and Legong dance are the popular. I still remember that beautiful costume! The dancers are young and lively.